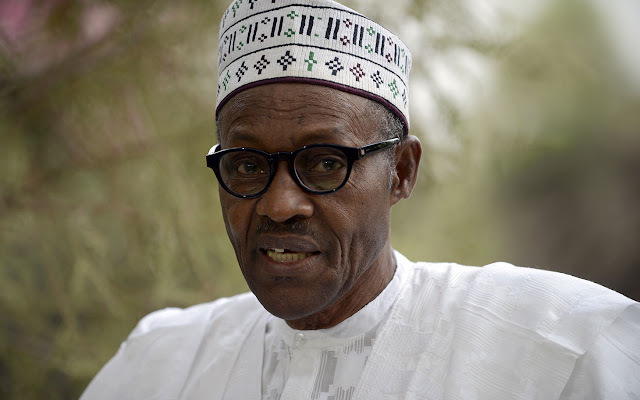 The Nigerian president, Muhammadu Buhari has finally signed the 2016 budget into law. 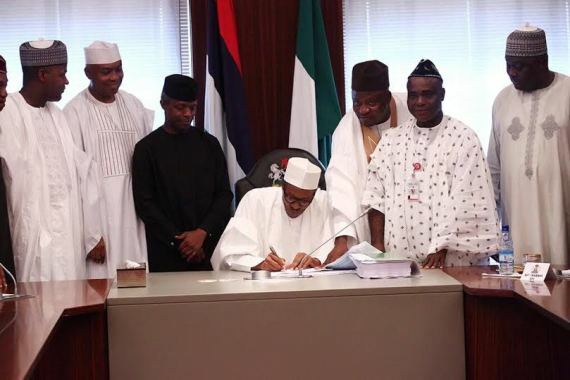 This was witnessed by the Vice President, Yemi Osinbajo, Senate President Bukola Saraki, Speaker, House Of Reps, Yakubu Dogara, Chairman of the APC, Chief John Oyegun, Minister of Finance, Kemi Adeosun, Minister of Budget ,Udo Udoma and Chairman of the Senate Committee on Appropriation, Danjuma Goje and his counterpart in the House Of Reps, Abdulmumuni Jibrin. Our correspondents have gathered that the Obafemi Awolowo University released another batch of students admitted into the institution yesterday, 4th May 2016. Expectant Candidate are thence advised to recheck their admission status on the OAU e-portal. Teachers, parents and students of the Obafemi Awolowo University Staff School have protested the non-payment of their four month salaries and the increment in the school fees of the students respectively. Leading the teachers in the protest, the chairman of the Senior staff Association of Nigeria Universities (SSANU), OAU chapter, Ademola Oketunde has called on the university authority to look into the new school fees proposed for the students. Also reacting to the development, a parent said the increment is too astronomical. For children of Staff, the fee was increased from N1,600 to N20,000 and for children of non-staff, it was increased from N2,500 to N20,500. Obafemi Awolowo University is set to lurk horns with the University of Ilorin in the final of the third edition of Nairaland Interschool Debate Competition which comes up on the 8th of May, 2016. This edition which is the third edition kicked off on the 19th December, 2015 with 25 tertiary institutions. It kicked off with essay submission stage where 16 schools qualified for the second stage out of the 25 schools that registered interest. The second stage which is the elimination stage saw 8 schools dumped out leaving the other 8 schools to advance to the quarter final. OAU edged past Ibadan Polytechnic in this stage. OAU and Lagos State Ubiversity, LASU were pitched against each other in the intellectual battle while Ahmadu Bello University Zaria and University of Ilorin were placed side by side to battle for a position in the finals. Following the activation of the request for accommodation for the Freshmen of the Obafemi Awolowo University, on Wednesday, 27th April 2016, many of the fresh students have not been able to secure accommodation on campus. It was discovered that the portal started to bring the error message that "the Bedspace allotted to your faculty has been exhausted" in about 24 hours after its activation. This was mostly first experienced by the female fresh students and later by the male. Ife, a female fresher in the College of Health Sciences lamented about the development saying "I don't know what to do now, I have been trying to get bedspace since last Thursday without any success and my Dad really wants me to live on campus". Another female student, Grace also expressed disappointment at the inability of the relevant body to provide her with accommodation even after paying the required tuition fees. Leicester City have been crowned Premier League champions for the first time in their history following Tottenham's failure to defeat Chelsea on Monday, the 2nd of May, 2016. Tottenham FC played a 2-2 draw at Stamford bridge against their fellow London rivals which paved the way for Leicester City FC to open a seven point gap with two games remaining. 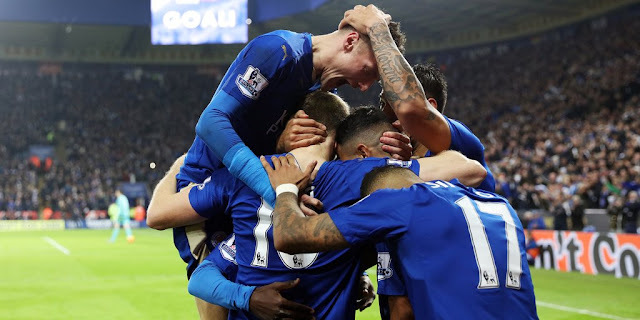 Leicester City FC also called the Foxes will now wait till Saturday 7th May 2016 to officially lay their hands on the trophy with a game against Everton FC. There is no doubt about the uniqueness of Great Ife and part of this uniqueness is that there are some conventional happenings peculiar to Great Ife students which one may not come across in other varsities. The university is in her fifth week of academic standstill owing to the annual sabbatical leave embarked upon by the Academic Staff Union amid the sessional break. It is just certain that Great Ife students who have been on recess for over a month now would have missed a couple of happenings they experience on daily basis while on campus. "WOLE PELU CHANGE EMI O NI #20 CHANGE O" i. e., “enter with your N20 note I don't have change”.